Hot sourdough bread with butter. Same slice. I just couldn’t decide which was the purtier. So maybe it’s because I went from making a 12-ingredient* fruitcake over Christmas to drizzling Baileys into snow last week that’s really making me appreciate the value of simplicity. Or maybe it’s because I’m an editor as well as a writer, and stripping the superfluous out of everything from copy to my Facebook friends list to food ingredients appeals to me. 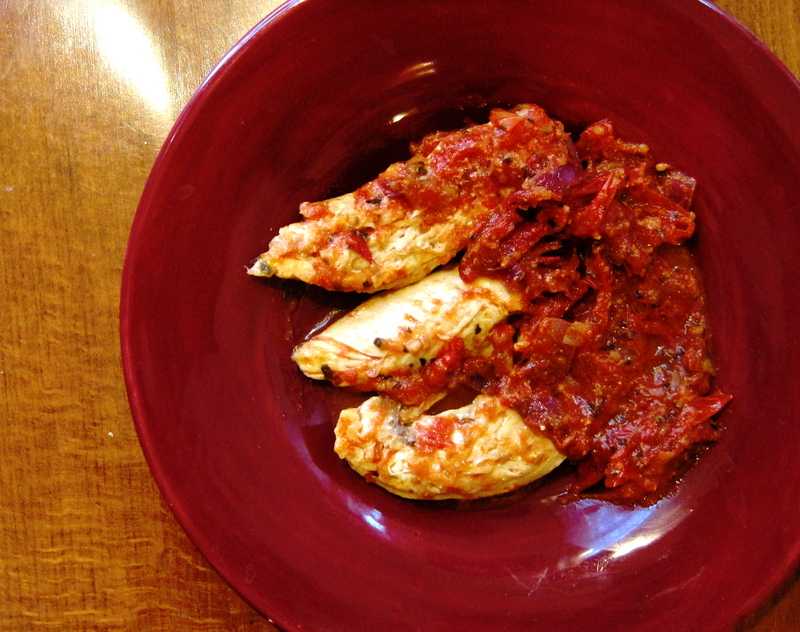 Or—this is probably it—it’s that the simpler the ingredients and prep, the more satisfying the dish. People usually assume that since I’m a food writer I put all of my focus on fancy restaurants, but to be honest, the opposite is true: I don’t care about fine dining. I care about ingredients. Choose the best ingredients and don’t mess with them too much. Why should you? They already had big plans to speak for themselves. Years ago Dr. Andrew Weil said his idea of the ultimate dessert was good-quality dark chocolate along with fruit, in season (this matters) and perfectly ripe. It’s both healthy and heavenly. For a real challenge along those lines, for a week (or more) keep recipe ingredients down to the bare minimum—three to five, tops. Pared down just to the essence of themselves, offered in the best possible light with the matchmaking** of your two sweet hands, and people start to call you a good cook. It’s nutty. The shots here are bloody good memories of mine. Every component of every dish is of good quality and consequently didn’t fail me. And none have more than five ingredients. 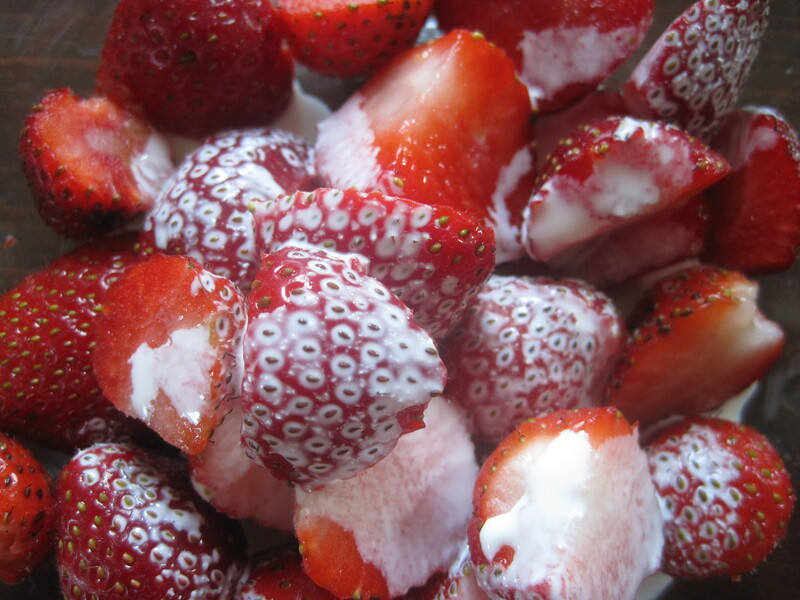 Just-picked organic strawberries and cream. 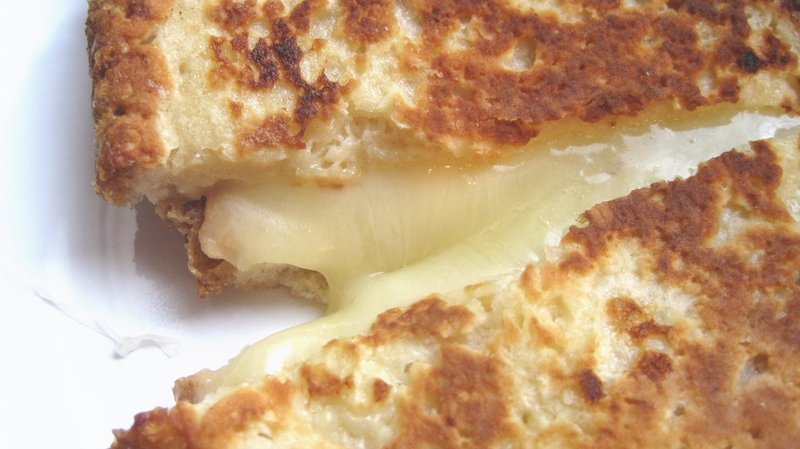 Mozzarella in carrozza: a cheese sandwich dipped in egg, dredged in flour, and butter-fried. 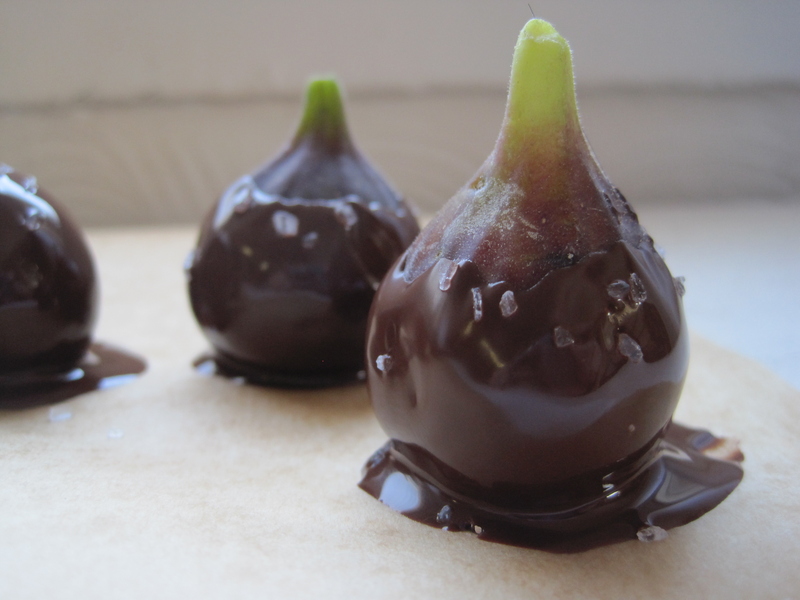 Organic figs I picked, then dipped in dark chocolate and sprinkled with fleur de sel. 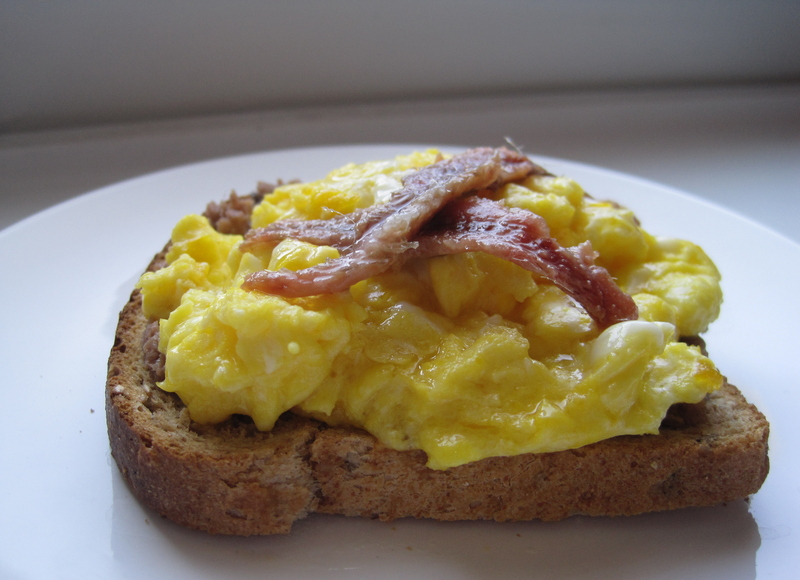 Scotch Woodcock: toast smeared with butter and anchovy paste, then topped with very softly cooked scrambled eggs and a couple whole fishie cuties. 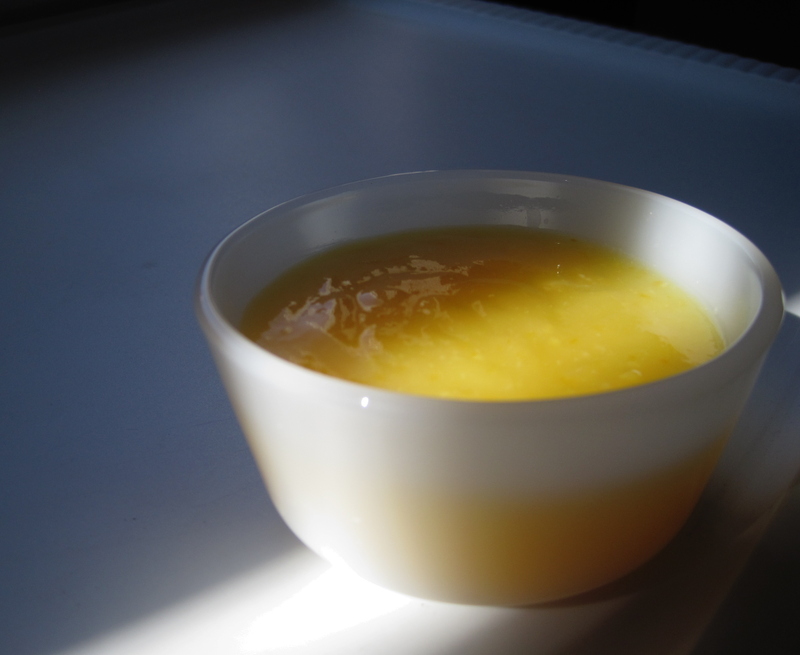 Lemon curd: lemon zest, juice, sugar and eggs, plus a little pat of butter. 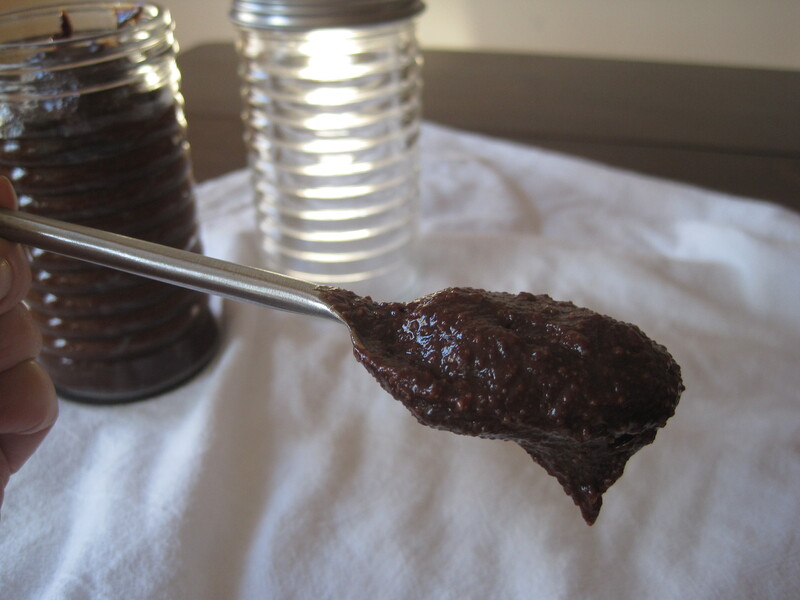 Gianduja (homemade Nutella): dark chocolate, toasted hazelnuts, sugar, cream and butter. 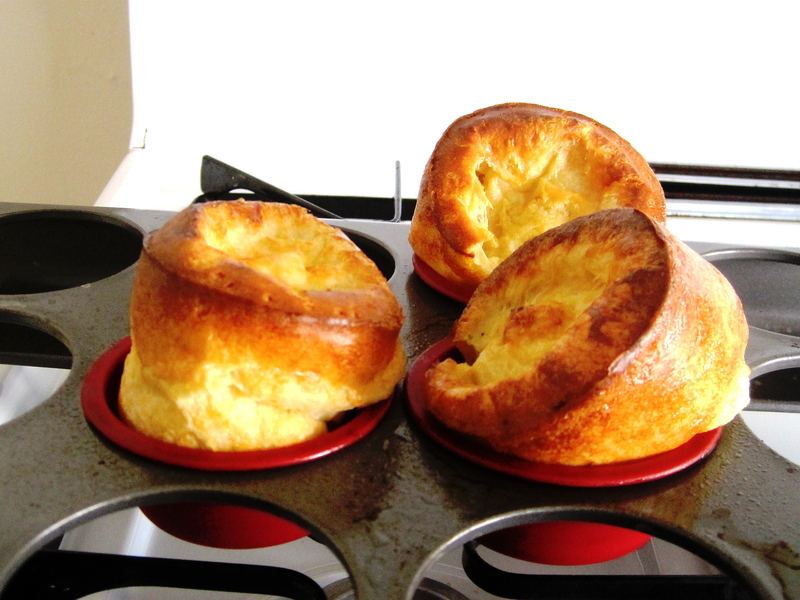 Popovers: all-purpose flour, eggs, milk, butter and salt. 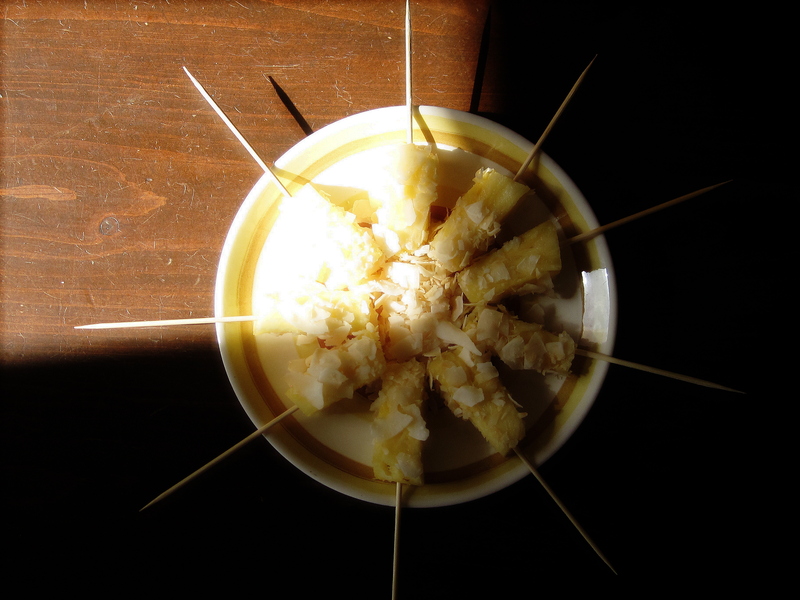 A pineapple kebob-like thing I came up with: fresh cut pineapple doused in Malibu rum and dusted with sweetened shredded coconut. 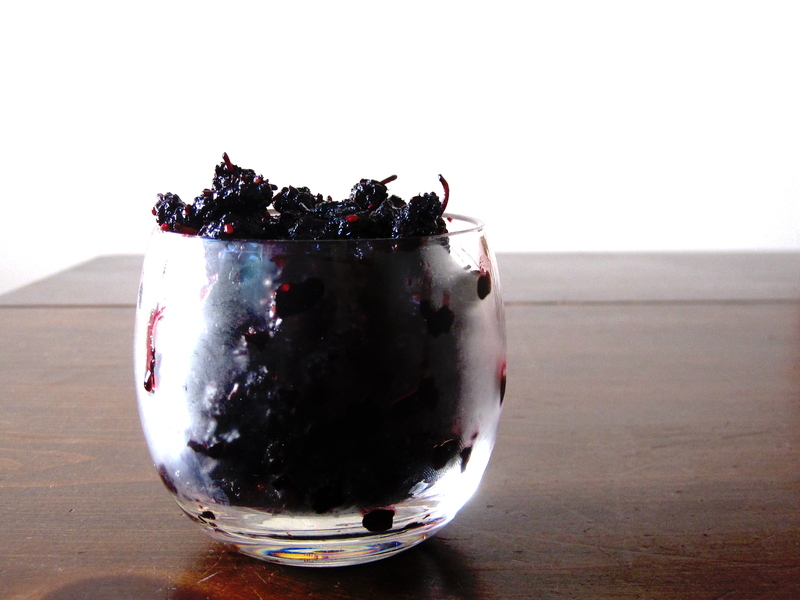 Another invention of mine: mulberries picked from the tree outside my balcony and cooked down into a jam with sugar, several hefty splashes of Petite Syrah, and ground cardamom. *And it would have been 13 but I couldn’t find candied angelica. **I couldn’t think of this word. I could only think of ‘shiddoch’. True story. So I Googled that to get me to the English word. The nine remaining drops of my sanity are going to fall out of my ears one of these days. ***I also mix metaphors the way good things come to those who take the bull by the horns. Last fall Charles Luce, one of my LinkedIn colleagues and owner of Luce’s Gluten-Free Artisan Bread, asked if I would review one of his bread mixes. I don’t typically use this forum for reviews, but was happy to in this case, one, because Charles has taught me so much about mushroom foraging (another of his skills) and I’m grateful; and two, because I am a carb girl, and thus open to any new horizons in a carb-like capacity. On his site Charles says ‘great bread is everyone’s birthright,’ and I bow to those words; they’re true, with no exaggeration at all. While I am not on a gluten-free diet, I was curious to find out what a homemade gluten-free bread would be like, in both taste and texture. And yes, I had a degree or two of skepticism. The sourdough mix arrived in a paper pouch with bench flour, parchment cut in precisely the size needed for the loaf, and a baking bag. It also came with remarkably detailed instructions on how to bake and enjoy the bread, down to how many strokes are needed to stir the dough. It’s very easy. I followed the instructions to the letter, slid the dough into the baking bag and into the oven it went. It was a cute little loaf, not the big San Francisco kind. But right for dinner or a few sandwiches. Out of the oven it came once it was nutty brown, and I waited for it to cool (both per the instructions). I pulled it apart; I wanted to see what kind of crumb I was dealing with. The crumb was no different than any other sourdough. I took a bite without any topping on it; I wanted to see what kind of flavor I was dealing with. 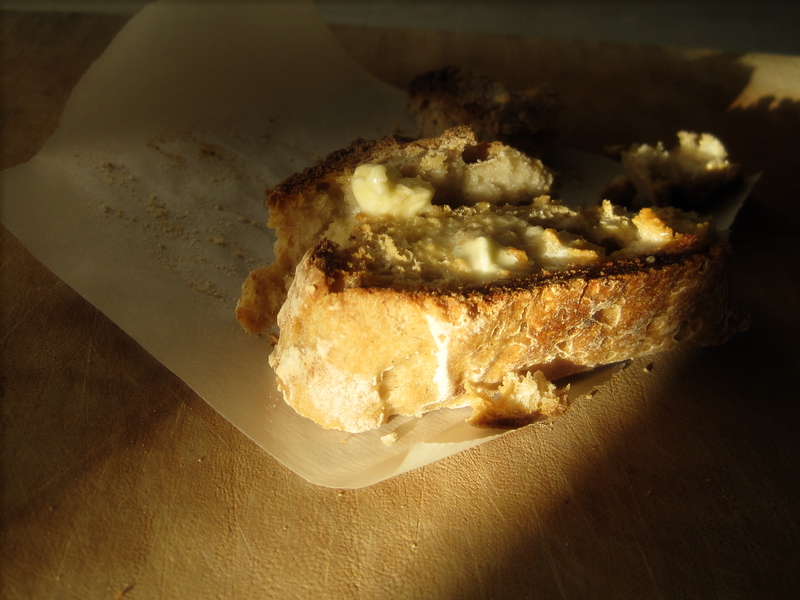 And again, it was simply sourdough—just honest, crusty, tangy sourdough. I wrote to Charles that night and told him if it were served to me at a restaurant and no one told me otherwise, I would never have known it was gluten free—a really pleasant surprise. I sliced it up and froze the remainder, taking it out piece by piece when I was hungry, dolling it up with salmon salad, or butter, or goat cheese/hot pepper jelly. 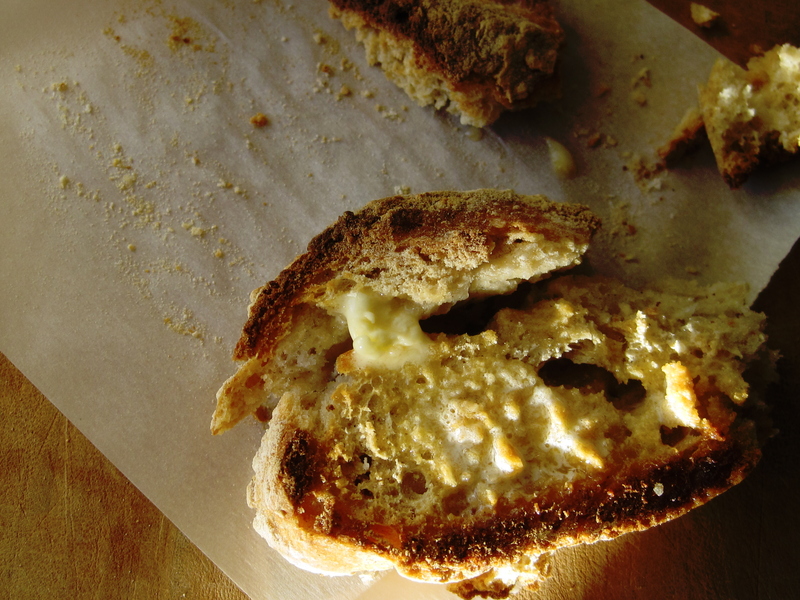 The bread became somewhat crumbly once defrosted; it might serve you best, as it did me, toasted. 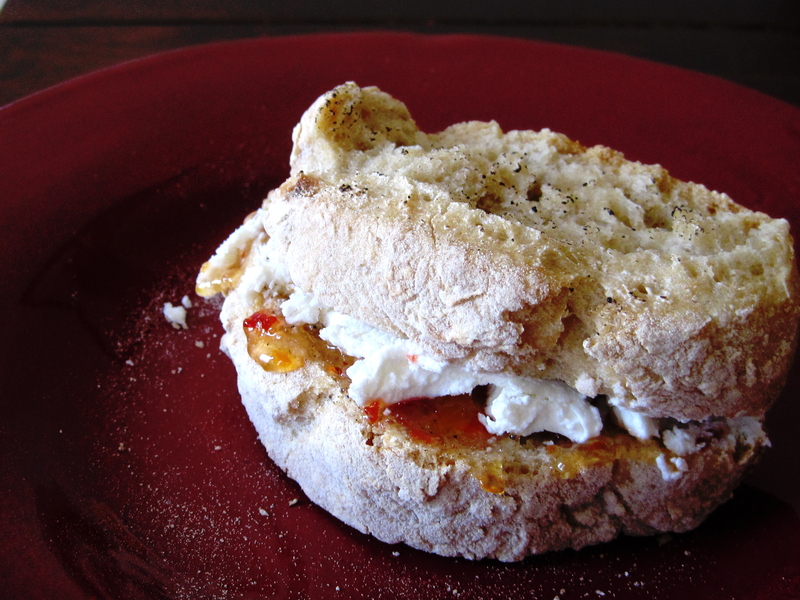 With fresh goat cheese and habanero jelly from another reader who owns Two Mile Creek Enterprises. That’s another review. I’ve reviewed many products and restaurants, and it’s odd for me to endorse a product entirely. I guess there’s a first time for everything. Nice work, Charles.